To unlock all the features that your Chromebook has to offer, you must first log in with a Google username and password. You can use your existing Google Account or create a new account at this time. Enter your Google Account username into the Username field. Enter your Google Account password into the Password field. The option to select a profile picture appears. Pick one of the default pictures, use your existing Google profile picture, or take a new picture. This completes the initial login process. On the login screen, click the Create a Google Account Now option. The Chrome web browser launches and takes you to a page where you can create your account. Complete the form and click Next. On this screen, Google wants to verify you are a real human being. Enter your phone number and whether you’d rather be called or texted, and click Next. Google will contact you in the manner you selected to provide you with a verification code. Enter the verification code and click Continue. Close the browser by clicking the X in the upper-right corner of the browser window. At this point, Google encourages you to set up a Google+ profile, but you don’t have to. On the bottom-right of the screen, click the word Guest. This reveals a pop-up menu with several options. Select Exit Guest from the list. Log in to your Chromebook with your new Google Account. Logging in to your Google Account allows you to use all of Chromebook’s functionality, but you can still access many of these functions without logging in. 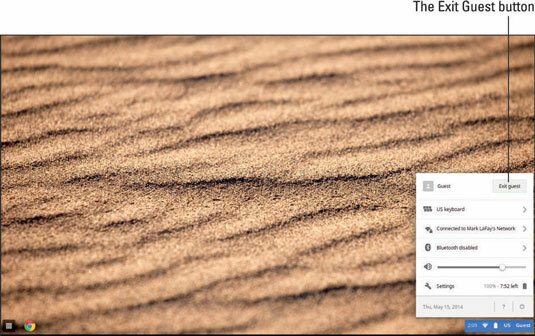 Chromebook allows you to use the device as a guest by selecting the Browse as Guest option. If you select Create a Google Account and then close the browser, you will be logged in as a guest and free to use the device with guest privileges. If you browse the device as a guest and then later decide to register or log in as a user, you first need to log out of the device. You can log out by clicking the word Guest on the bottom-right of your screen and then selecting Exit Guest from the top of the list. This takes you back to the login screen.